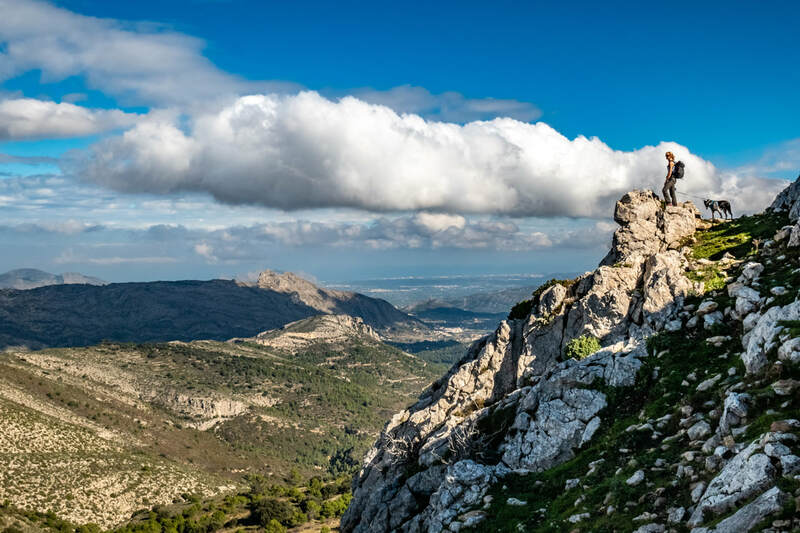 Our excellent knowledge of the Costa Blanca mountains will ensure you enjoy fabulous walks, see amazing sights and have a great holiday. We offer a bespoke itinerary suited to your mountain walking experience. Costa Blanca is famed for its walking itineraries, there are so many we’re spoilt for choice. The landscape is spectacular with dramatic mountains, deep valleys, whitewashed villages where time seems to stand still and carpets of wild flowers, and all beneath the bright blue sky. This is what walking in Spain is all about. The area is full of history with ruined castles on craggy mountain summits, ancient Mozarabic steps providing convenient paths into deep valleys and snow pits built in the early 18th century to supply ice for villages on the coast. …and, if you love flora like we do, then there is an abundance of it and you will be in paradise, especially during the spring! About our walks and walking holidays: We offer walks to suit all abilities. There are walks up mountains which are virtually pathless and feel wild and undiscovered, rocky ridges with easy scrambling over rocks, stunning high level circuits of mountains on good tracks as well as easy paths which explore fertile valleys full of almond, orange, lemon and olive groves. Whilst out walking you’ll find out about the history, flora, fauna and landscape that we walk through. And we aim to end the walk with a welcome drink at a nearby bar or café. When? We run our walking holidays from October to May on dates to suit you. Winter here is an ideal time for walking with a mild climate (average temperatures of 14˚ to 20˚c) and low rainfall. Autumn, spring and early summer also offer lovely, though warmer temperatures to walk in. Day 1: Arrive and transfer to accommodation in Llosa de Camacho. Short walk in Val de Llosa. Day 3: High level circuit of the Sierra de Bernia. Day 4: Easy day. Visit to mountain village of Guadalest and a walk around the lake if you wish. Or simply chill out at the beach! Day 5: Cavall Verd ridge. Day 7: Depart. We hope to take you out on another short walk before you leave!